Cohesive Mobility Solution (COMOS) is set to launch its electric vehicle (EV) sharing programme next month, and ahead of that, it has opened membership registration to the public. The scheme is the first of its kind in the region. COMOS is giving 100 lucky members the chance to enjoy unlimited usage of the car-sharing services during the trial period, which is between the date of the programme’s launch in October and the end of the year. After that, full deployment will take place. What has been achieved so far since the ‘soft launch‘ in June? Well, the Renault Zoe and Renault Twizy, both of which are not on sale for the Malaysian public, have been approved by the Land Public Transport Commission (SPAD) and the Road Transport Department (JPJ). 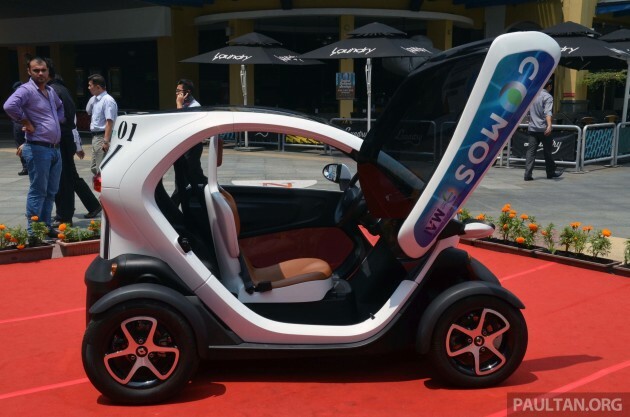 According to COMOS executive chairman and ex-Proton MD Datuk Seri Syed Zainal Abidin, JPJ has decided that you need a car licence to drive the Twizy, which effectively classifies it as a car and not a motorcycle. You wouldn’t be allowed to take it on the PLUS Highway, apparently – most likely for safety reasons, as it wouldn’t be able to reach highway speeds. 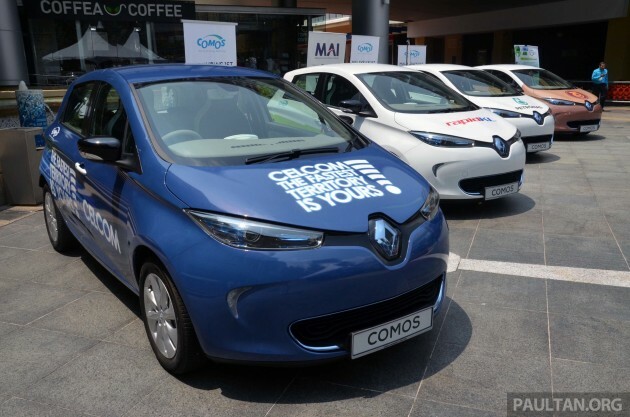 To date, 46 Renault Zoes have arrived in Malaysia for COMOS, and 30 Renault Twizys are set to land in November. Nissan Leaf? Next year. 60 Klang Valley locations have been identified for charging stations, and at 15 of these, work has already begun. By 2017, the aim is to have the service running in Langkawi, Penang, Melaka and Johor Bahru, with rapid charging stations located at every rest stop along the North-South Highway. Branding agreements have been signed with Petronas, Universiti Teknologi Malaysia (UTM) and Celcom. 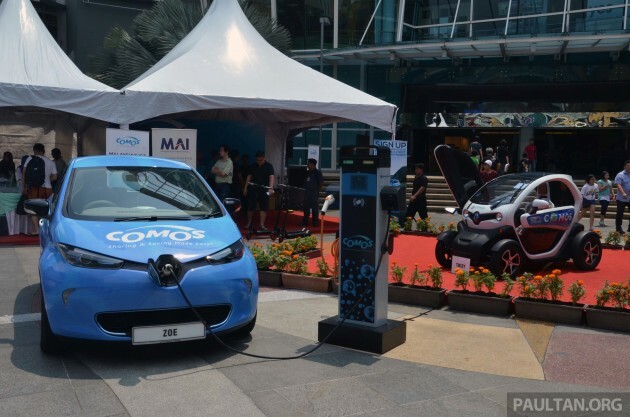 COMOS is working with UTM to develop and commercialise hydrogen charging systems for EVs, and Celcom will provide the payment gateway and vehicle connectivity. COMOS also shared tentative pricing with members of the media at a recent briefing – membership fees of RM300 annually or RM50 monthly, along with RM20-25 per hour of usage. It’s not just about private users – COMOS is also offering corporate leasing packages, which include unlimited mileage, periodical maintenance and a wall-mounted charger at the customer’s location. There’re also advertising packages, which give you three free membership cards for one year. Both packages will include customers’ logos on the cars, and both are eligible for corporate double tax deduction. 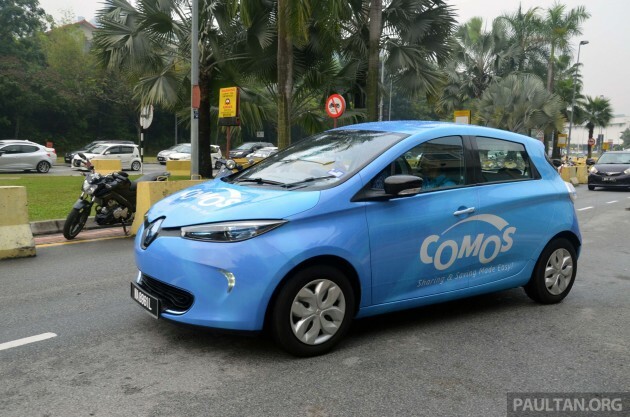 Through the leasing package, COMOS claims to offer savings, over three years, of nearly RM30,000 for a Renault Zoe against a Honda Civic, and RM33,000 for a Nissan Leaf over a Honda Accord. These are based on tentative monthly lease prices of RM4,450 for the Zoe and RM5,300 for the Leaf. EV tourism is also in the plans, under the COMOS EcoRide moniker. Tourists will be able to rent Twizys from hotels and tourist centres, and use them to explore, with navigation and voice-guided tours thrown in. The concept is planned for Langkawi, Putrajaya and KL. DBKL is also apparently interested in using the Twizy for patrolling purposes, Syed Zainal said. With all said and done, I had a short spin in the COMOS Renault Zoe. It was late afternoon and the office crowd was taking to the roads in Mutiara Damansara in full force, which meant I could only have a quick fling around The Curve’s inner road. Simple – all you had to do was touch the RFID membership card on a scanner located behind the windscreen’s bottom-right, a green light would flash and the car would unlock automatically. You then get in, enter a six-digit PIN into a little machine on the windscreen’s top-right, answer some rudimentary questions (Do you possess a valid driving licence? Are there any damages to the vehicle? ), press the start button (car key already in the slot) and you’re good to go. Not much to be gleaned from the test drive (I drove it for all of ten minutes), safe for everything you’d expect – a good dose of instantaneous, low-down torque, along with whisper-quiet progress. Low-speed brake pedal action took some getting used to – nothing much in the first few centimetres of travel, and then a lot of retardation thereafter. The brakes are regenerative, of course. The steering seemed to be devoid of any feel, feedback or weight, but ride comfort wasn’t bad. Still, as much as we seem to love placing electric cars on an out-of-reach, out-of-reality pedestal, the Zoe drives very much like a… well, car. I eagerly await a second date for further inspection! DSSZ is the champion. will Done Dato Seri I bet everyone will back DSSZ in this program. I will try this when available. Biggest joke is that Proton said it’ll sell electric car in 2014. Tell me about it. proton and their Ev and hybrid cars is a nightmare. what joke? please clarify, finish your sentence! Hopefully COMOS will bring in Tesla’s Model S and Model X in the near future. That will set up the infrastructure for the cars, paving the way for us private citizens to buy them. I personally got to see up close and sat in a Tesla S when I was in Japan and boy am I impressed with the quality that is oozing out of the Tesla vehicle – love that big LCD touch screen at the center. Only issue is the price is approx. USD80k after u add in some optional specs. Unless our Bolehland government can subsidize EEVs, this will be priced above any BMW 528i or E400 cars over here. no right hand drive yet.. Please check Tesla’s website. RHD Tesla Roadster’s have been available for the UK market since 2010. RHD Model S should be available by the end of the year. If you dont know anything dont slander and become DAP macai; the other side of the same UMNO macai coin. TNB has always opposed the biased, 1-sided IPP agreement forced upon them by the gomen. You right, and feel no more safe this time. I will just let my gf to drive well I sit beside her, let her play with this Twizy. All very cool…this paves way to future tech for EV’s in our country. Happy to see the infrastructure is coming up nationwide sooner or later so all the best to COMOS. It will also be very awesome to actually see both the BMW i3 and i8 on Malaysian roads when COMOS builds enough charging stations for BMW Malaysia to warrant bringing those futuristic vehicles here. But the cost however quite high, unless, there is drop off service. First you need to get to an available car (likely at the some locations like a train hub or shopping mall) then pay an hourly rate. Then again, if you need to go anywhere in KL by car, you will also need to park, and the clock continues to tick. If lets say I “rent” a Leaf to drive for a day (say if my car is in the shop) it may cost +200/day. If Uber hasn’t been nuked by the JPJ by then, its seems like UBER still might be a more logical choice, as long as the cars service your area. On another note. Now JPJ has certified the Twitzy… can I grey import one and register one? How does that work???? you got it totally wrong… U don’t need to hold onto the car for the whole day. Say u need to go to multiple places today (i make example – LRT Kelana Jaya –> KLCC –> Citta Mall –> IKEA –> LRT Kelana Jaya ) and each venue will take 2 hours (meeting or shopping + lunch etc la). 6th . tag again and the rent starts until u end it at CItta Mall. So basically u pay to drive. Don’t worry about parking fees as it is all under that rental of hourly basis. I am sure you don’t need more than 1 hour to drive from LRT kelana jaya to KLCC. It’s cheap..it’s easy..u can choose to ignore KL famous traffic jam when u know u can plan to use LRT on the way back which should be close to your house. 2 years time MRT will connect almost all Klang Valley. to make it cheaper for your pocket..rent the car and split the rent among your 2 or 3 other friends traveling with u in the same car. As long as there is a pickup and drop off location. Would this be cheaper and more convenient that taking a Taxi or UBER? u got it totally wrong. U pay only when u drive. u don’t need to hold onto the car for the whole day unless of course u don’t mind paying. say u go to 3 different places in a day . u justneed to pay rent DRIVING from point A to point B and rents stops when u get out from the car. parking fees are included so no more bloody expensive parking like in KL Sentral. 2 or 4 hours later u book again the car from your current point B …drive again to point C. rent starts from Point B to point C. I believe u don’t need more than 1 hour to drive say from PJ to KL, right? to make it more saving, split the rent with your friends. Renault Zoe can fit 5 adults inside. this is car rent not taxi..
uber is ride-sharing/limo not taxi. uber is not taxi. cannot pick up from roadside or even take calls, only through app. Uber is a sort of official car pooling service but you will pay the owner to share his ride and way with you during drive. I’m quite skeptical with this business model. Still, new business ideas normally get tested in the west, like Uber etc. We, asians are normally late adopters. Has anyone seen similar model anywhere else in the world? I know there are several bicycle-sharing programs adopted in cities in the west, but some are either closed down, or bleeding cash. But, let’s see how this pans out. Who knows, they’re on to something great? Wouldn’t hurt to support your fellow countrymen. Try checking Zipcar. They’ve been around since 2000.
i would definitely prefer this rather than owning a car. I’ve been waiting for this car-sharing concept in Malaysia. I tried to sign-up on the website but no confirmation email from them. Singapore has 2 or 3 companies implementing car sharing since 2005. All are based on Zipcar or streetcar car sharing business model.